Who is this for? 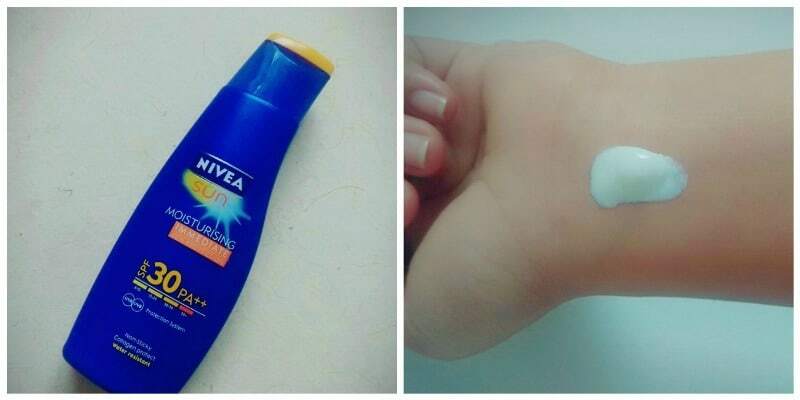 The Nivea Sun Lotion SPF 30 is for those looking for a body sunscreen lotion that is affordable. Its curvy packaging makes it look quite attractive. It comes in a regular stable bottle with a screw cap on top which makes it travel-friendly. The formula has an aqua fragrance and is white in color. It is very easy to apply because it isn’t one of those thick types. While applying, the sunscreen lotion looked clear white to me but it disappeared after getting mixed into the skin. It took me about 30 seconds to blend the whole formula because my skin is dry. It stayed for up to 2-3 hours after application and is water resistant. This sunscreen is highly moisturizing, so I will not recommend its use during the summer season. People who have oily skin should refrain themselves from using it, because they may experience oil or sweat on their face or on the body. It is indeed the best suited and pocket-friendly sunscreen lotion for dry skin during the winter season. It reduced my tanning and gave my skin a healthy look. I have used it for about 4 months during winters and I am completely satisfied. Yes, I would definitely recommend ladies who have dry skin to use it in winters. I will repurchase it during the next winters. Nivea Body Lotion Aloe Hydration : Your Summer Bestie ? Best Body Lotion for Summers in India ! Biotique Bio Vera Body Lotion With Spf 75 : Worth It ?